S-9500 Color Stain achieves a decorative acid stain look without the hazard or special handling. S-9500 Color Stain is a water-based, penetrating, non-acidic, acrylic/urethane emulsion that creates a natural look on new and existing surfaces. S-9500 Color Stain is durable and protective. It can be brushed, sprayed or sponged on to create even, mottled, or marbleized effects. S-9500 Color Stain is available in 20 standard color Pigment Packs. Custom Colors are available upon request. 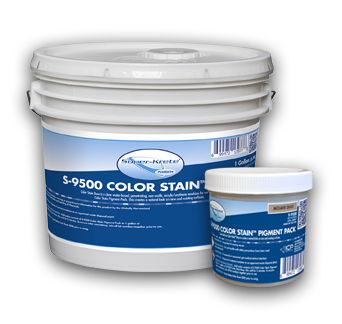 S-9500 Color Stain is an easy application and requires a water clean-up.